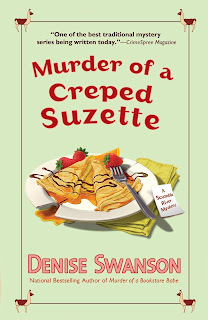 S kye Denison from Denise Swanson’s New York Times bestselling Scumble River mystery series talks about her life and adventures. I am so nervous. My biographer, Denise Swanson, tells me the latest book about my adventures came out on Tuesday and that we won’t know how well it did for a week or more. I sure hope people are still interested in reading about what’s been going on in Scumble River. Because, believe me, there is never a dull minute around here. As I mentioned last month, Murder of a Creped Suzette, the October 4th book is all about Rex Taylor, a music promoter who was determined to turn Scumble River into the Branson of the Midwest. Although the concert featuring Flint James, a hot new country music star, and Suzette Neal an up and coming one, was fun, I knew right away that turning out town into a tourist trap would not bring out the best in people. What I didn’t realize was that it would result in murder. And what really surprised me was the prime suspect. First, I would never have thought he had it in him to kill someone, or second commit the act would give him the motive for the murder. However, I did have a sneaking suspicion that the tension in town among those for the country music theater and those against it, would spill into the school. And boy howdy, did it! Fights broke out between the parents and teachers, the students, and even the PTO got involved. I spent so much time acting as mediator; it was hard to meet all the IEP and case study deadlines. Then when I wasn’t at school, I had a cute little dog that I somehow ended up fostering, to contend with. We won’t even go into what my cat Bingo thought about that situation. And I do have to say my ex-boyfriend Simon ended up being a real help with both the dog and the murder investigation. His new attitude reminded me of why I used to love him. Added to the stuff going on at school and the dog, was my other work as the police psych consultant. At first, it didn’t look as if I’d have much to contribute the investigation, but that changed really fast and I ended up right in the thick of things—again! No wonder one of my principal’s calls me a dead body magnet. On the personal front, Wally and I had to deal with a major threat to the annulment he’s been seeking to dissolve his previous marriage. The whole situation really made me wonder if we’ll ever get to set a wedding date. 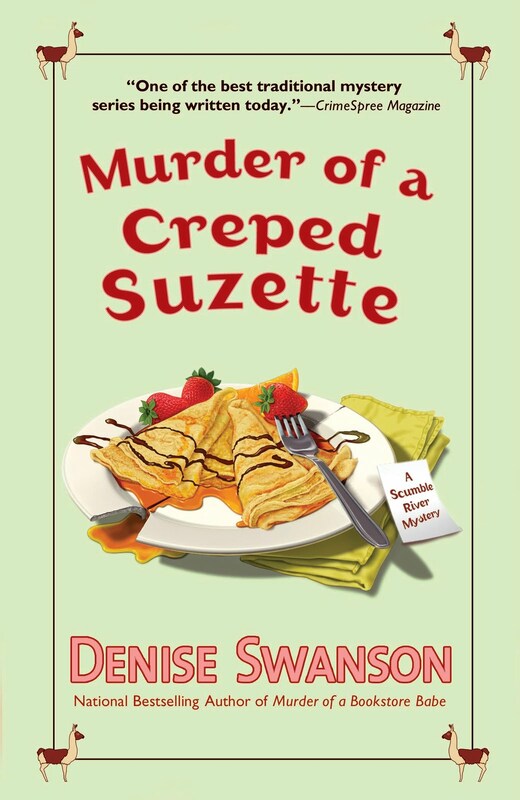 I don’t have time to go into that right now, but if you’re interested, you can read all about that in Murder of a Creped Suzette, which is on sale now. This books sounds like a fun read! I love the title. Good luck! Personally, I love that Scumble River never has a dull moment. Can't wait to read this book. Many happy sales to you with this new book release! Congratulations on the new adventure!